Learning object location on the image with Proposal + Classification approach is very tiresome since it needs to classify >1000 patched per image. Therefore, use of end to end pixel-wise segmentation is a better solution as proposed by FCN (Long et al. 2014). FCN oversees the contextual information since it predicts the objects of each pixel independently. Therefore, even the thing on the image is Cat, there might be unrelated predictions for different pixels. They solve this by applying Conditional Random Field (CRF) on top of FCN. This is a way to consider context by using pixel relations. Nevertheless, this is still not a method that is able to learn end-to-end since CRF needs additional learning stage after FCN. Their experiments construes the effectiveness of the additional contextual features. Yet there are two important points to consider before using these features together. Due to the scale differences of each layer activations, one needs to normalize first per layer then append them together. They L2 normalize each layer's feature. However, this results very small feature values which also hinder the network to learn in a fast manner. As a cure to this, they learn scale parameters to each feature as used by the Batch Normalization method so that they first normalize and scale the values with scaling weights learned from the data. The takeaway from this paper, for myself, adding intermediate layer features improves the results with a correct normalization framework and as we add more layers, network is more robust to local changes by the context defined by the aggregated features. They use VGG16 and fine-tune it for their purpose, VGG net does not use Batch Normalization. Therefore, use of Batch Normalization from the start might evades the need of additional scale parameters even maybe the L2 normalization of aggregated features. This is because, Batch Normalization already scales and shifts the feature values into a common norm. Note: this is a hasty used article sorry for any inconvenience or mistake or stupidly written sentences. Think "Turing Test" in another way ? After some crawling on the Internet, I stumbled upon this thread on Quora. For the lazy ones, the thread is about the things that can be done by humans but not by computers after N years. There are many references to Turing Test in answers stating that the best AI is still not able to pass Turing Test; therefore we do not need to worry about AI being an existential threat for the humanity. First off, I ought to say that I am on the cautious side (like Elon Musk and Bill Gates) on AI being a threat. To explain myself, I would like to show that AI is a threat that has begun to affect, even we think the Turing Test as the validation method. We only need to think in a different way to verify the test. 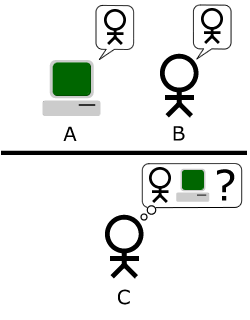 For the ones who don't know what Turing Test is; A and B (one machine - one human) are hidden from the human observer C. Looking at the interaction between A and B; the observer C tries to decide which one is human and which is the machine. If observer C cannot decide whether there is a machine or a human behind the curtain; than the machine passes the test. Conclusion is that machine exhibits intelligent behavior equivalent to, or indistinguishable from, that of a human. A and B is hidden from the observer C and given the interaction between the observer and the entity behind the curtain the observer tries to decide whether there is a machine or a human behind that curtain. From the definition, it is one of the legitimate milestones for AI to compass human capable agents. Therefore, it is normal for people to evaluate present AI to define its state and future potential using Turing Test. I think a different formation regarding Turing Test where we replace the observer C with a machine as well. Then the remaining question turns out to be, is the machine C able to identify the machine A or even is this identification is necessary henceforth? Thinking the formulation in that way resolves many concerns for the AI supporters who say AI is not a threat since it does not and will not be able to pass Turing Test (at least in the short run). Nevertheless, when we replace C with a machine than the machine does not need to pass Turing Test to be a threat, right? Because we are out of the context like poor B depicted on the above figure. Now let me explain, what does it mean in practice, changing the observer human with a machine. I believe real life "communication" is a good way to illustrate Turing Test. Think about the communication history. We started with bare foot messengers and have come to light speed flow of the today's world. At the time, we were sending a message and waiting very long for the response. The reason was the tools were the bottleneck for the communication. First we expedited these tools and come up with new technologies. If we think today, then we see that our tools are so fast that we are the bottleneck of the flow any more. We send our mails and messages in a second that bursts the inboxes and message stacks and consequently bursts us as well. If we also accept that the communication is the bare bone of the today's business world, companies do not want to waste time - time is money- and attempt to replace the slowest part with faster alternatives and so computerized solutions come to stage in place of humanized old fashion solution. Now, after we changed the tools for communication, we also start to change the sides of the communication up to a point that there is no need for any human being. There, we also have a fancy name for this Internet of "Things" (not humans any more). If you also look to the statistics, we see that huge partition of the data flow is between machine to machine communication. Could you say, in a more immense level of communication revolution, indistinguishability of a computer agent by a human observer is important? It is clear that we can still devastate our lives by our AI agents without passing Turing Test. You can watch out unemployment rates with the growth of the technological solutions. Basically, what I try to say here is, yes, Turing Test is a barrier for Sci-Fi level AI threat but we changed the rules of the test by placing machines on the both side of the curtain. That means, there is no place in that test (even in the real life) for human unless some silly machine cannot replace you, but be sure it is yet to come. Final saying, I am an AI guy and of course I am not saying we should stop but it is an ominously proceeding field. The punch card here is to underline the need of introspection of AI and related technologies and finding ways to serve AI for human needs not the contrary or any other way. We should be skeptical and be warned. This work posits a way to integrate first order logic rules with neural networks structures. It enables to cooperate expert knowledge with the workhorse deep neural networks. For being more specific, given a sentiment analysis problem, you know that if there is "but" in the sentence the sentiment content changes direction along the sentence. Such rules are harnessed with the network. The method combines two precursor ideas of information distilling [Hinton et al. 2015] and posterior regularization [Ganchev et al. 2010]. We have teacher and student networks. They learn simultaneously. Student networks directly uses the labelled data and learns model distribution P then given the logic rules, teacher networks adapts distribution Q as keeping it close to P but in the constraints of the given logic rules. That projects what is inside P to distribution Q bounded by the logic rules. as the below figure suggests. I don't like to go into deep math since my main purpose is to give the intuition rather than the formulation. However, formulation follows mathematical formulation of first order logic rules suitable to be in a loss function. Then the student loss is defined by the real network loss (cross-entropy) and the loss of the logic rules with a importance weight. is the student model weight, the first part of the loss is the network loss and the second part is the logic loss. This function distills the information adapted by the given rules into student network. Teacher network exploits KL divergence to approximate best Q which is close to P with a slack variable. Since the problem is convex, solution van be found by its dual form with closed form solution as below. For the experiments and use cases of this algorithm please refer to the paper. They show promising results at sentiment classification with convolution networks by definition of such BUT rules to the network. My take away is, it is perfectly possible to use expert knowledge with the wild deep networks. I guess the recent trend of deep learning shows the same promise. It seems like our wild networks goes to be a efficient learning and inference rule for large graphical probabilistic models with variational methods and such rules imposing methods. Still such expert knowledge is tenuous in the domain of image recognition problems. Disclaimer; it is written hastily without any review therefore it is far from being complete but it targets the intuition of the work to make it memorable for latter use.